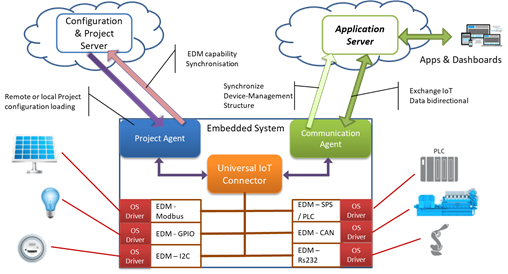 The SGET-defined software interface serves as a universal docking point for cloud services to embedded hardware. Portwell is one of the initiators of the SGET standardization group, which accelerated the definition of the standard. In order to guarantee rapid market penetration, Portwell supports the launch of the UIC with its comprehensive portfolio of modules, boards and systems. Dreieich, Germany, Portwell (http://www.portwell.eu), a world-leading innovator for Industrial PC (IPC) and embedded computing solutions, providing cloud and data center solutions with innovative network computing platforms, announces broad support for the Universal IoT Connector (UIC), introduced by SGET (The Standardization Group for Embedded Technologies). The SGET-defined software interface serves as a universal docking point for cloud services to embedded hardware. Portwell is one of the initiators of the SGET standardization group, which accelerated the definition of the standard. In order to guarantee rapid market penetration, Portwell supports the launch of the UIC with its comprehensive portfolio of modules, boards and systems. Since UIC is available on Microsoft Windows 10 IoT and Linux, it is addressed to a very broad user base. Portwell fully accommodates this approach as it covers the concept of UIC with a variety of processor classes from Intel Atom to Xeon. This means that Portwell’s products, such as the Intel processor families Baytrail, Braswell, Apollo Lake, Skylake and Kaby Lake, offer great support module- and system-wise. Many live demos will be featured regarding the use of UIC and M2MGO at Portwell’s booth in hall 2-340 during the embedded world Conference 2018 in Nuremberg from 27.02. until 01.03.2018. These demos also include other SGET members. One of the systems is based on the Qseven Module PQ7-M106 and the Carrier Board PQ7-C201. This module is equipped with an Intel Baytrail processor and uses Windows 10 IoT Enterprise as an operating system for the demo. Portwell offers customer-specific adaptations of hard and software and addresses OEM’s in many markets including automation, medical, transportation, logistics, energy, retail and communications.